Edited by Adrian Heathfield with Fiona Templeton and Andrew Quick. A limited edition box containing artefacts, documents and critical theory from an international field of performance artists, theatre makers and writers. Shattered Anatomies is a maverick intervention into the debates on the status and imaging of the body in Western culture and the historical preservation of transient performances. Contributors: Bobby Baker, Lenora Champagne, Jim Clayburgh (The Wooster Group), Ethyl Eichelberger, Tim Etchells (Forced Entertainment), Richard Foreman, Goat Island, Gerry Harris, Peter Hujar, Joe E. Jeffreys, Simon Jones, Alastair MacLennan, Julian Maynard Smith (Station House Opera), Susan Melrose, Andrew Quick, Rachel Rosenthal, Caroline Rye, Carolee Schneemann, Gordana Stanisic, Stelarc, Fiona Templeton and Tony White. 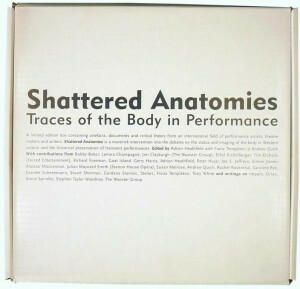 Shattered Anatomies: Traces of the Body in Performance. Arnolfini Live, Bristol, 1997. Homepage image: Photos © Alastair MacLennan from ‘Shuttered Anemonies’ in the Shattered Anatomies collection.